This is the second part of a three-part series of dispatches from Jonathan Dworkin, an infectious diseases fellow at Brown who spent several months in Iraqi Kurdistan in 2006 and returned for a followup visit in May. Part 1 is here. The final installment will appear tomorrow. satellite television channels, magazines, and websites, as well as newspapers. As is typical with television, and particularly with web media, the change has led to more vitriolic criticism of the government. The government’s response has been one of the defining disasters of the Kurdistan region. 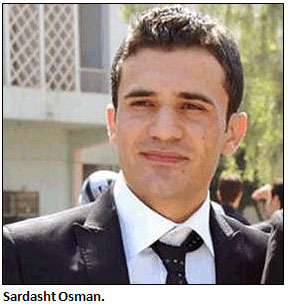 In May of 2010 a Kurdish student named Sardasht Osman was abducted outside his college in Erbil, the capital of the Kurdistan region. Two days later his body was found in Mosul. It was a gruesome murder, and it was highly unusual. Erbil, like the rest of the Kurdish region, has experienced almost no terrorism-related violence in the Iraq War. The unofficial boundary between Kurdish and Arab Iraq is patrolled by the peshmerga, Kurdish soldiers who man checkpoints along all the major roads. Furthermore, Osman was a well-known critic of Massoud Barzani, the Kurdish region’s president, and he had written several inflammatory articles for Kurdish websites. In an article written five months before his death, he wrote metaphorically that he wished he could marry one of Barzani’s daughters, so that he could benefit from the family’s famous nepotism. For months before his death Osman had received anonymous threatening calls. These increased in intensity after the article dealing with Barzani’s daughter. His friends and family say that he was terrified, particularly around government security vehicles. He went to the police in Erbil, but he received no help. After the murder, Barzani’s government promised an investigation. The conclusion of an anonymous committee was that Osman was connected to a terrorist group, and his death was due to his refusal to participate in terrorism. This report — notably clumsy considering Osman was a well-known secularist — was immediately rejected by everyone who knew the victim. Even the terrorist group, Ansar al Islam, took the unusual step of denying the killing. Human Rights Watch, in a report on journalistic freedom in Iraq, concluded that the investigation was bogus. If the incident were isolated, the Kurdish government might have some leeway. Unfortunately the murder is part of a broader context of ugly attacks on journalists and opposition members. A Times story on the murder referenced the Kurdistan Journalists Syndicate, which reported 357 cases of intimidation, assault, or arrest in 2009. Libel suits and threats to shut down “unlicensed” media outlets are the most common forms of harassment. As Michael Rubin has pointed out, Kurdish authorities have not investigated the murder of an opposition journalist for Lvin magazine in 2008, nor did they investigate the murder of an opposition politician in Dohuk in 2005. Human Rights Watch, in its report on the Osman murder, documented several threats made against Osman’s friends and family after they refused to accept the findings of Barzani’s anonymous commission. Most importantly, the media crackdown has not ended with the cessation of the recent protests. Intimidation is ongoing, as evidenced by the arrest of the editor of Lvin during my current visit. Speech in Iraqi Kurdistan is not free, but it is valued. Sardasht Osman’s murder led to large protests, which foreshadowed the even larger protests this spring. Despite the violence, opposition media continue to proliferate. Nalia, the television station recently burned down in German Village, is again up and running. The secular opposition Goran (“Change”) Party has an immensely popular channel, which each night features stories of government abuse and corruption. Hawlati and the other independent papers are now the most respected, and the internet is proving as difficult to control here as it has in other countries. Given the personal risks people take to speak their mind in Kurdistan, it is immensely reassuring to see such a growth in activity. The press here is bruised, but it is kicking harder than ever. The damage done to the Kurdish government’s credibility, though, may be irreversible. Rather than establishing normal party politics, accepting criticism, and ultimately allowing for a healthy ebb and flow of power, they are digging in. They are, as many here have pointed out, imitating the Arab despotisms that they have long claimed to despise. This explains the growing pessimism in Sulaimania. Though people have not given up on the project of building a democratic society, most no longer have faith in their ability to shape their government. Violence is the new reality, and opposition is the only path left open to them.